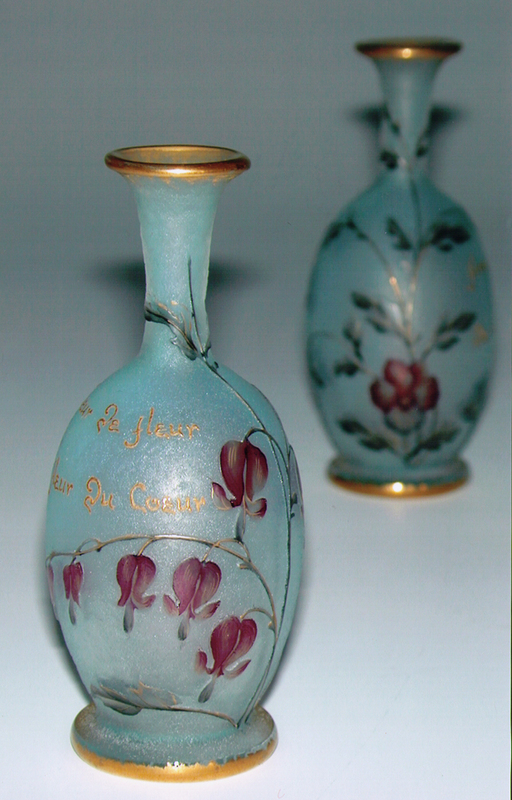 Daum-Nancy is world –wide known for its glass. In this article Mrs Tiny Esveld wants to show the different types of Daum glass. All these examples of vases were or are for sale in the gallery Tiny Esveld, In Rijkevorsel in Belgium. 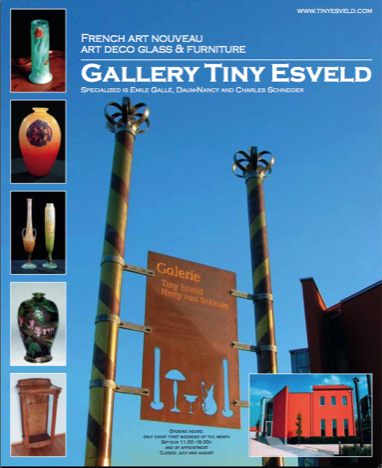 You can visit mrs Esveld’s website www.tinyesveld.com to see a part of the present collection for sale at the moment or take a look at the new book Mrs Esveld just wrote about the art made by Gallé and his family. This hardcover book takes you in 300 pages back to the era and the city in which Gallé lived and worked and has more than 600 images, of which many were never published before. If you want an appraisal of a vase you own or of a vase you intend to buy, Tiny Esveld does appraisals. Read more about appraisals. 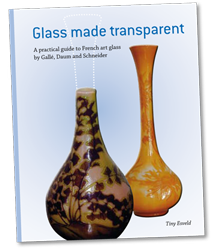 This book helps explain what you ought to know before you purchase a French art glass vase. It describes what you should be looking for and all the hidden traps. 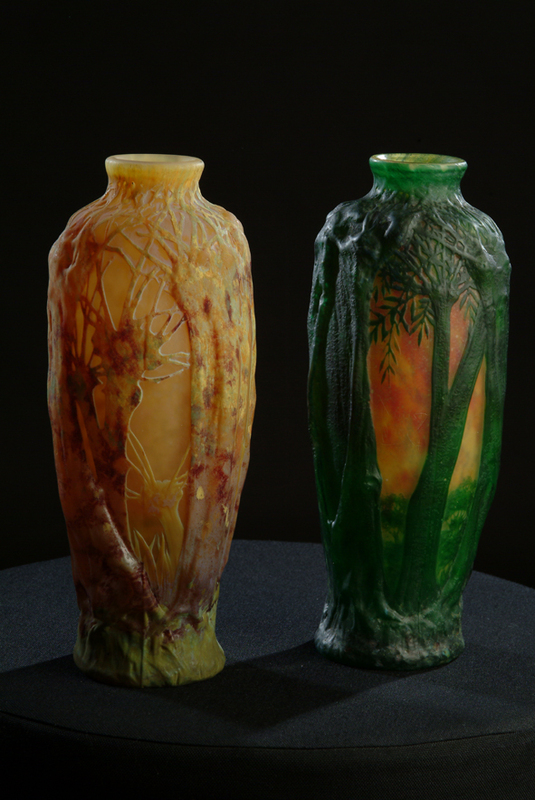 You will be able to discover whether a vase has been altered, reduced in size or whether it is a fake or genuine. Jean Daum, a notary from Bitche, lent money to the proprietors of a glass factory in Nancy. In 1878 when they couldn’t repay their debt, Daum became the owner of the factory. This was just a few years after the German-French war. When the border changed, many rich people, including the Daum family, found themselves suddenly in German territory.They moved to Nancy which became a prosperous town. Jean Daum risked all his money and the only way for the business to survive, was to get every member of the family involved. Two of his sons were to lead the factory and they married daughters of rich businessmen whose dowries went straight into the glass factory. The three daughters of Jean Daum were asked not to marry as he didn’t want to spend money on their dowry.These women, Louise, Jeanne and Fanny, worked without pay for the rest of their lives. 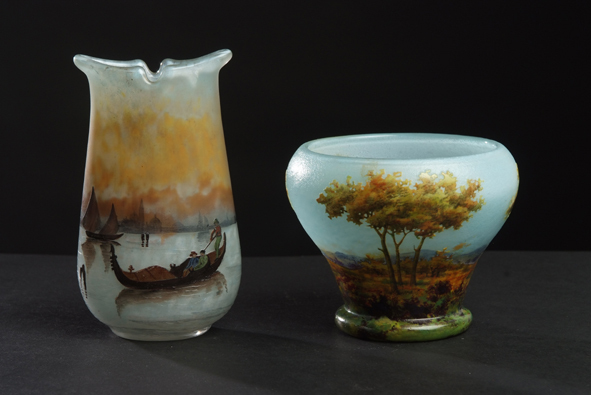 The factory began by producing drinking glasses and pitchers and in 1891 started with artistic glass. The success of Emile Galle was inspiring but as the Daum family was a family of investors and not of artists, they hired the best artists they could find. Jacques Gruber, Henri Berge, Almaric Walter and Charles Schneider were four of the many artists working for Daum. These men could not use their own name, all the vases were signed Daum. The factory produced high quality glass and In 1900 Daum got his first “ Grand Prix”. Daum’s great achievement was the vitrified vases they started to make in 1903. These were outstanding. 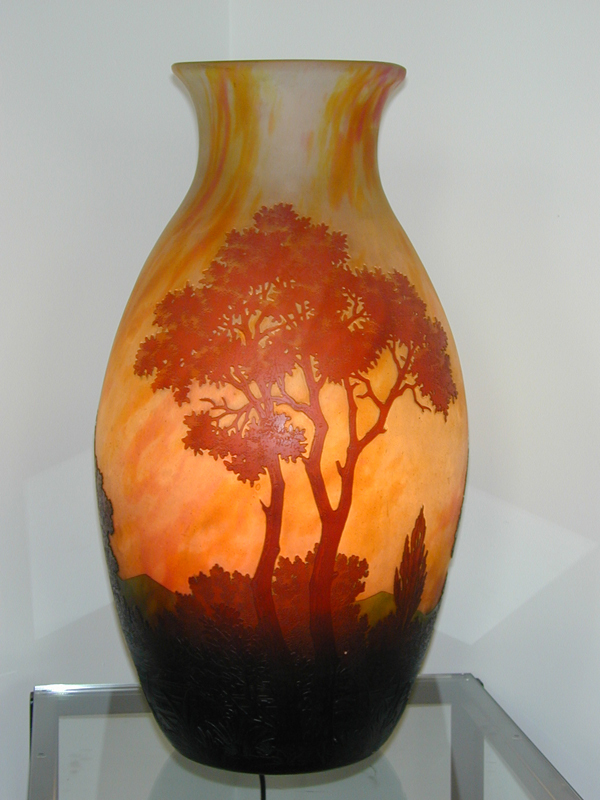 The Daum lamp with the forest is a beautiful example of this technique. Foto 15 a. Daum didn’t copy Galle,they found their own path. Of course many of the Galle and Daum vases resemble each other. They were made in the same era and both used wheel engraving and acid-etching. 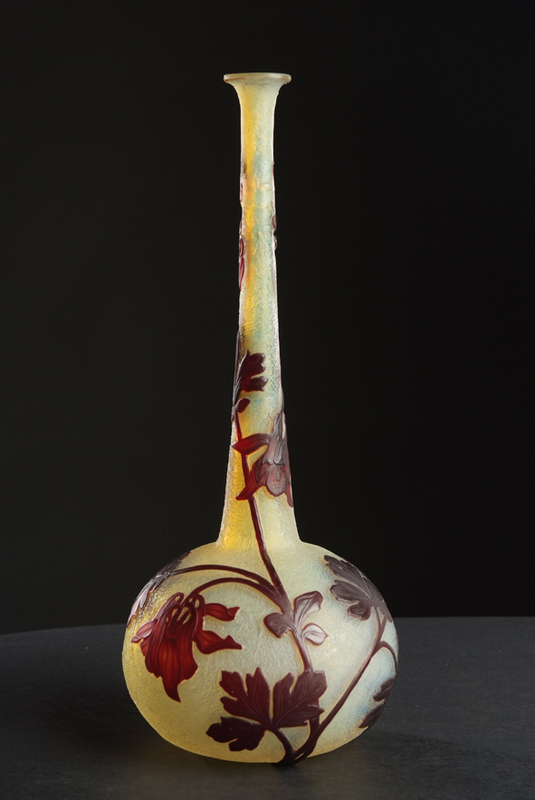 But with the intercalair and enamel vases, Daum took his own place in the art nouveau period. People all over the world love these little vases with natural flowers and landscapes. 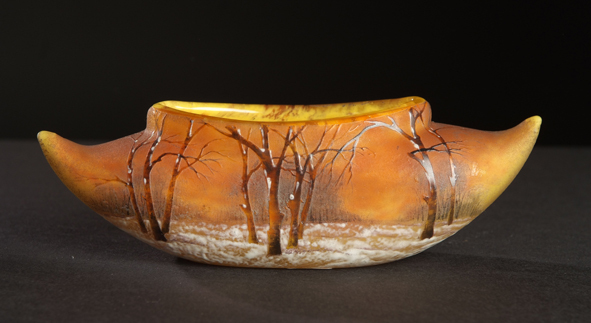 The shapes are attractive, the etching is very refined and the colours are pleasant to the eye. A fine example is the orchid vase. 13 a.
Daum joined forces with Louis Majorelle. He didn’t have a carpentry section, nor an iron workshop so needed Majorelle for the woodwork and the ironwork. This collaboration flourished and Majorelle made some of the finest bronze mounts for Daum lamps. These lamps were exhibited on Majorelle tables and cabinets and Daum and Majorelle displayed each others work in their showrooms. Just alone they could not compete with Galle and when Galle died in 1904, it was a great advantage for Daum. After the first world war the third generation continued the work their fathers and grandfather had started. The art deco period had begun. Daum glass continued to renew itself with the spirit of the period. After the second world war colourless crystal was a favourite. Clocks, candlesticks, lampbases, animalfigures, etc. were popularl wedding presents. In 1981 the last member of the Daum family left the factory. The factory had been taken over by CFC, compagnie francaise du cristal. The new firm continued to use the legendary “Daum” name. The firm has been sold several times since then. The history of the Daum factory starts in 1878 with Jean Daum buying an old glass factory in need for his two sons. This factory produced tableware, drinking glasses and decanters in clear glass with gilding. First period. Drinking glasses and art glass with historic influences. 1878-1895. Gradually the line of product of this factory changes into art glass. First they procuce drinking glasses with gilding. So mouth blown glass and then handpainted with gold. When you buy such a glass , the gold must be still fresh and visible. No two pieces are identical. Then their drinking glasses become little pieces of art. 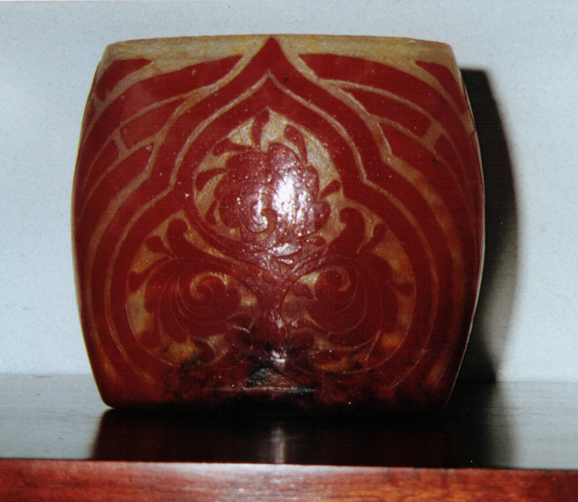 Some of the glasses are wheelcarved by hand. Some are acid-etched and some have a combination of these three techniques, gilding, carving and acid-etching. Most of the glass is clear glass, but after a while they start to use light green, light pink and light brown. The subjects on the glass can be flowers of the region or historic themes linked to national feelings of Lorrain. Such as the French rooster or the thistle or a fleur de lis. Sometimes these pictures are accompanied with a text. In this case , we name the glass: “verrerie parlante”. In English this means: “talking glass”. One that I personally like enormously ,is the one with the poison ivy: “Je meurs ou je m’attache”.I find this so romantic. Another example is: Qui s’y frotte, s’y pique.” This text is accompanied with the thistle. When you touch a thistle , it will hurt. Really these vases refer to the French-German war in 1870. The French want to say: “Germany do not touch us, you will get hurt.” The world exposition in1889 influenced the Daum brothers enormously. Antonin and Auguste Daum were impressed by the work of the great art nouveau artist Emile Galle. This was the beginning of a new era. Cameo glass and pate de verre. The Daum brothers decided to start their own art department. With the help of Jacques Gruber and Henri Berge and Almaric Walter and Charles Schneider ,they designed vases and lamps and chandeliers and art objects. Many of these objects were made as art objects, not to be used. That is why many of these objects have survived a century, because they were displayed in cabinets as objects of value. They were extremely expensive at the beginning of the 20th century and still are a hundred years later. 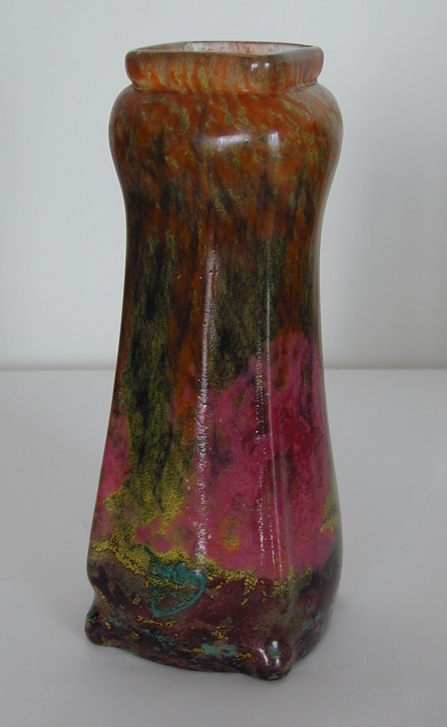 The vase is protected with bitume de Judee. The part that is left uncovered is eaten by the hydrofluoric acid. The acid will give a depth to the vase. This process can be repeated. Most of the time the vase is lowered in an acid bath. This was unhealthy for the workmen. A pattern is cut on the vase with the use of a rotating wheel. The difference between acid-etching and wheelcutting is, wheel cutting is done by skilled men and took many hours. Wheelcutting is more refined, more detailed then acid-etching. Wheelcutting that looks like a piece had been hammered. Applications. Every piece of glass that is applied on the vase while it is still hot. This can be a handle, a band, etc. Painting the vase with glasspowders. After the painting the vase will be heated again, so that the powders become glass as well. The vase is rolled into glasspowders on a marble table. Afterwards the vase is heated again. Between two layers of glass. A pattern with glasspowders is placed on a marble table. Then the vase picks up this pattern. Afterwards the vase is covered with another layer of glass, so the pattern is between two layers. 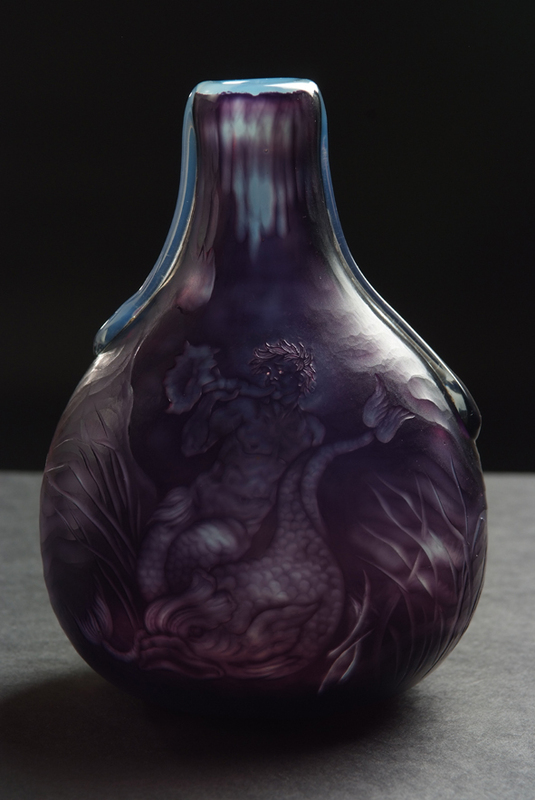 Hot pieces of glass are applied on the surface of a a vase to make the decoration. The hot vase was rolled over a marble stone, so that the applied pieces were embedded.